Main Street Station has a ring to it - like Grand Central Station – and is, similarly, a hive of activity, centrally located, and connected, through history, to trains. From 1880 until the 1930s, the narrow gauge railway lines stopped at the Breckenridge depot located on the south side of town, just across the street from the current location of Main Street Station, Breckenridge, CO. Near here, trains crossed the Blue River and headed on to Frisco and Leadville. Built in 2000, Main Street Station replaced the Bell Tower Mall, which was one of the first commercial malls in the town dating from 1970. Shops and restaurants are on the ground level just like the old place, and Main Street Station has a bit of a throwback look to 1880s mining towns as well. For residents, the property includes underground parking, elevators and concierge service and free shuttles. Any Main Street Station condo for sale will be convenient for people who like to be in the center of town. And while it is a resort feel with all its amendities, Main Street Station is walking distance to three trailheads that lead into national forest or other public lands. Want to learn more? Find out more, or browse the current Main Street Station condiminium listings below to find your ideal home. 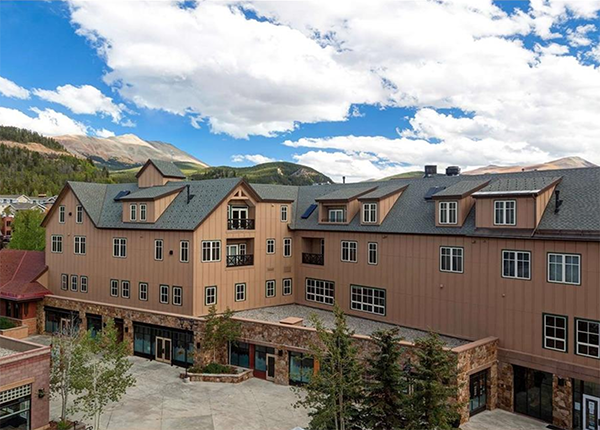 Today, Main Street Station real estate includes several options: one part is in the pool of an interval-ownership group, but most are individually owned condos and they range from studios to 4-bedrooms. 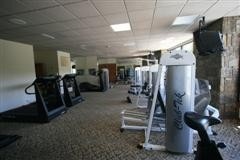 The entire property is managed by Resort Quest, which provides 24-hour guest services; on-site fitness center, with eucalyptus steam room, 6 hot tubs, heated indoor and outdoor pool; gym; small theater; meeting rooms; underground parking and a free in-town shuttle for guest of Main Street Station. Any Main Street Station condo for sale has the potential to generate top-end short-term vacation rental income for its owners. 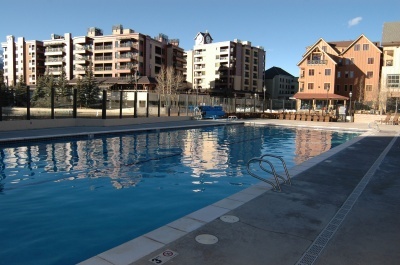 Along with Main Street Station condos, you’ll find ski shops, restaurants and access to the Maggie Pond, the fitness center, the pool and spa facilities. There are numberous meeting rooms, banquet facilities and the complex is home to many conferences and events. In the summer, a few select concerts happen in the plaza as well as a weekly farmer’s market. Building Main Street Station, in 2000, the town also improved the congested intersection at Village Road and Main Street, and so getting to and from this area is easy by car, but best of all, visotors and homeowners at Main Street Station homes can walk or right the free bus anywhere in the county. 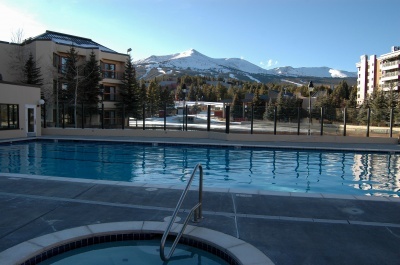 The views are fantastic and access to ski lifts is a short walk through the Village Plaza. Size: 355 sq. ft. to 1957 sq. ft. Amenities: 24-hour guest service, shuttle, underground parking, Pioneer Club fitness center, restaurants, meeting rooms, hot tubs, indoor/outdoor pool. From the traffic circle at the north of Breckenridge, continue on Highway 9, which will become Park Avenue. Follow Park Avenue to the light at the three way intersection where Main Street Station will be on the right. Continue through the light and the entrance is the first driveway on the right. Find out more about owning a condo in Main Street Station by sending us a message or calling us at (970) 453-2200.